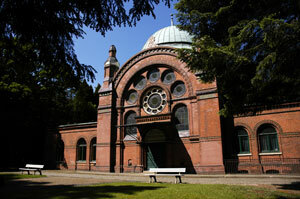 The Jewish Cemetery in Ohlsdorf was opened on 30 September 1883. It reaches across eleven hectares and covers approx. 18,000 graves. 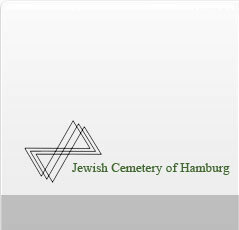 In addition, it is the only cemetery in Hamburg, where is still buried according to Jewish rituals. 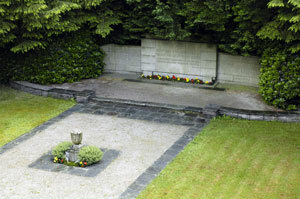 In June 1937 the jewish cemetery at the Grindelquarter was completely removed by the Nazis. Under the conduct of chief rabbi Dr. Carlebach only 200 stones could be transferred to Ohlsdorf and about 175 gravestones from the cemetery Ottensen in 1939 and 1941 . The burial ground of the Sephardi Jews (so called Portuguese Cemetary) are rather special. The Jews who had been expelled from Portugal and Spain around 1490 took their burial tradition along with them when immigrating to Hamburg: tombs, grave stones laying flat on the ground and stones in a sarcophagic style. A memorial for the victims of the holocaust opposite the ceremony commemorates the 190000 German and over 5 Million murdered European jews . A single detached urn contains soil and ash from the Auschwitz concentration camp.The memorial wall behind shows the shield of David, dates and a quote from Jeremia 8,23 "...that I might weep day and night for the slain of the daughter of my people"
Close to the exit on the left is the burial site in honor of the deceased jewish soldiers of the 1st World War (1914-1918) with an obelisk in its centre. 85 bodies were transfered to Hamburg to be buried here next to two long steles which commemorate the names of 1000 deceased jewish soldiers. Male visitors are requested to wear a head covering. 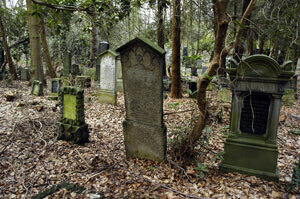 Kippahs can be borrowed from the green box at the entrance gate and should be replaced when leaving the cemetary.